Dan Schiedel, RSU Public TV general manager, said Will Rogers had an amazing impact on American and Native culture, and because of the university’s partnership with NAPT, the two entities have expanded the reach of the film to school children across the nation via www.willrogersed.org. The site provides educational material for various subjects, including language arts, social studies and media. “Digital learning activities such as research skills and outlined technology demonstrations will engage students,” the NAPT release states. 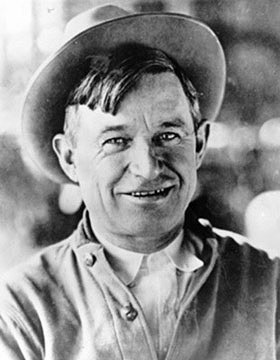 “More importantly, the educational materials include political commentary, event comparisons and a time line of Will Roger’s life as structured around the historic events that took place.”Comment: For more on Will Rogers, see Will Rogers on Wall Street and Play About Will Rogers's Courtship.